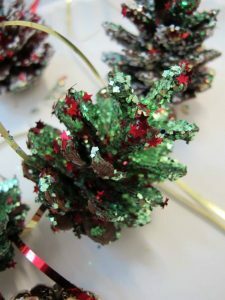 As children I’m sure we’ve all sprinkled far too much glitter onto a pine cone and hung it from the Christmas tree… but have you ever wondered where your festive pine cones come from? 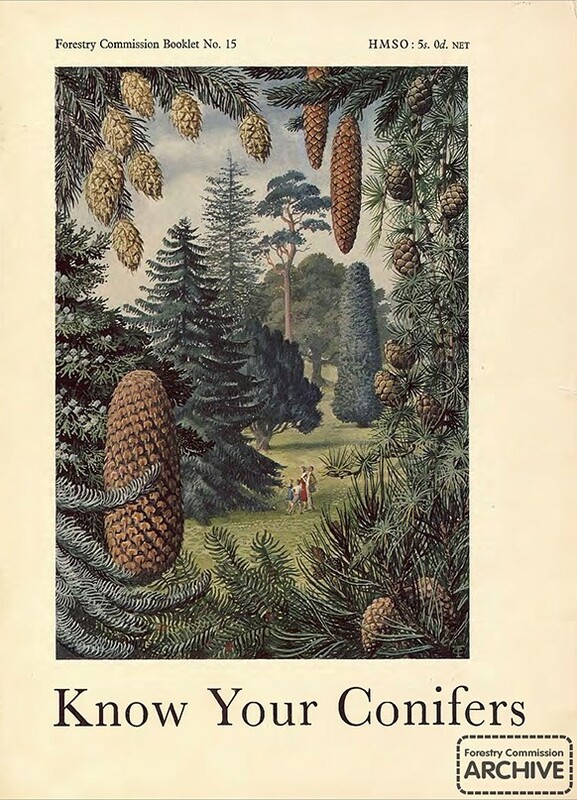 Well, you could have a look through this Forestry Commission 1966 “Know Your Conifers” booklet with cover art by Charles Tunnicliffe. If you’d prefer a paper version to the PDF, The MERL have both the 1966 and 1970 editions in their library. You can phone the The MERL on 0118 378 8660 if you’d like to make an appointment to have a look. Their collections also include further examples of Tunnicliffe’s artwork, including the seasonal “What to Look For…” Ladybird books. Most of the pine cones sold for crafting in the UK are harvested from Pinus nigra var. austriaca – The Austrian Pine. The cones take around two and a half years to reach maturity and take on the open shape that allows their seeds to be wind-dispersed during the winter. Austrian Pine is commonly harvested for construction lumber and pulpwood for making paper. It takes between 15 and 40 years for trees to reach sufficient maturity, and although large seed crops are only produced at 2–5 year intervals, that’s still a lot of cones to decorate! So how about some cones that you don’t need to decorate? 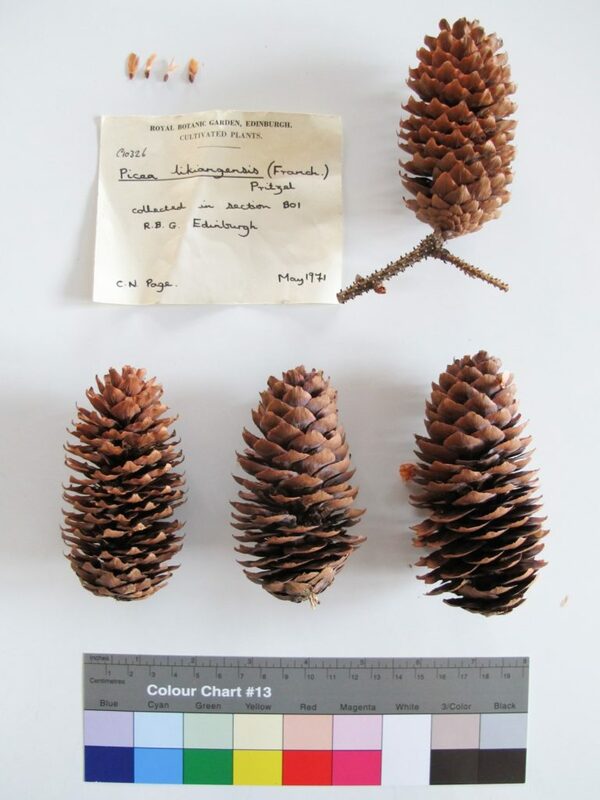 These Herbarium specimens are the mature cones of Picea likiangensis, the likiang spruce. 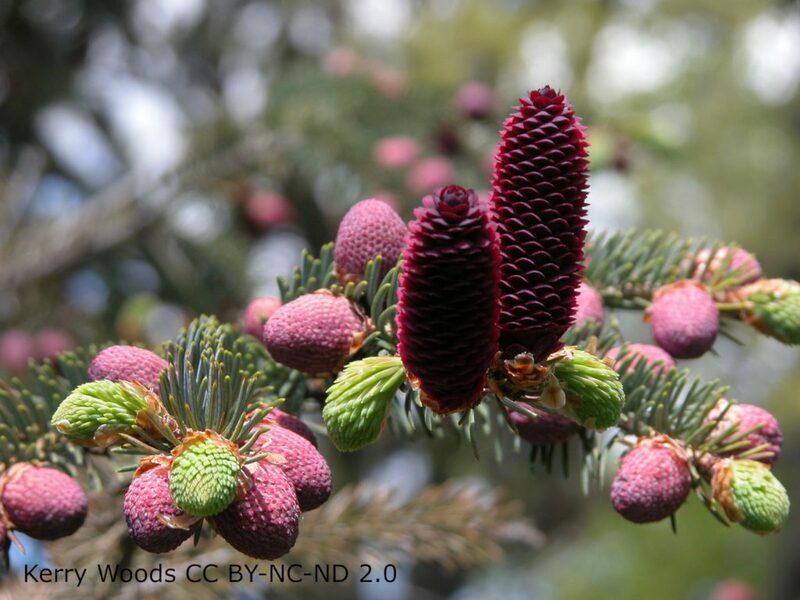 If you’re not planning a trip to Bhutan or China to see it you could plant one in your garden (if you’ve got room for a 25m tall tree), and the cones as they develop are a beautiful shade of pink. 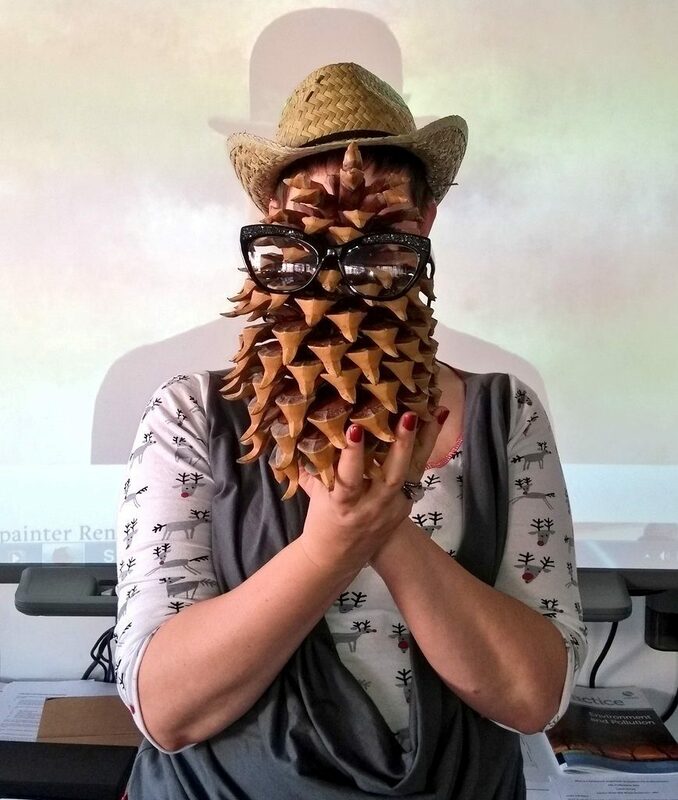 If you don’t have space to grow a 25m tall tree just for the cones, how about a pine cone that could easily take the place of a Christmas tree? 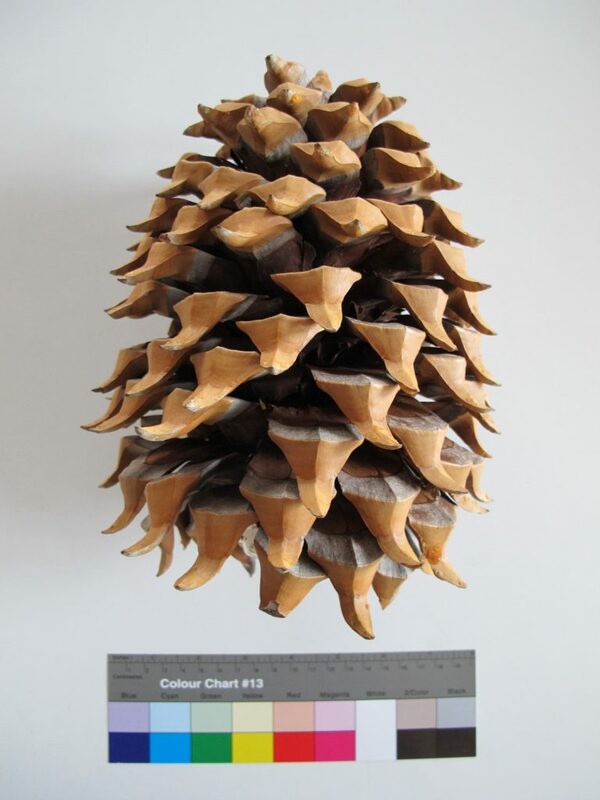 Pinus coulteri is commonly known as the big-cone pine, because the cones are (wait for it…) very big! It’s also called the “widowmaker”, as the cones can weigh several kilograms and are rather spiky. If you don’t want to decorate with pine cones, you could always eat them. Well, not the whole thing, unless you’re a squirrel, but the seeds of the Italian stone pine (P. pinea) or the Korean pine (P. koraiensis) are the varieties most commonly grown commercially to produce pine nuts. If you have any sprouts left over from your Christmas dinner you could try out this recipe for sprouts with bacon and pine nuts, or this one for sprouts, pine nuts and blue cheese. Not so much Son of Man as Daughter of Pine… with apologies to Magritte! In America the pine nut is an important food for a number of Native American peoples, and they’re collected from the Pinyon pine (Pinus edulis). In the video below Shanna Yazzie, a Navajo from Cameron, Arizona, show us how they’re traditionally picked, prepared and enjoyed.